I am a mom of two boys who writes about our struggles to help our youngest son overcome what will be a lifelong visual impairment, and our attempts as a family to embrace what life gives us each day. My journey into motherhood began abruptly when Jack, my oldest, was diagnosed with severe reflux and a milk protein intolerance at 10 days old. At 4 months old he refused the bottle completely and we started him with a feeding tube. He was tube fed until he was 2.5 years old, when we completed a feeding reintroduction program through Seattle Children’s Hospital. Now he is the best eater we know and the scar from his tube on his tummy is the only remaining evidence of his struggle. We waited to have a second baby until Jack overcame his eating issues, so they are 4 years apart. After William was born, he immediately showed the same signs, so we started him on the formula we finally found worked for Jack. At 5 months old Will began to refuse the bottle, which sent me into a tailspin. The blog was born out of that horrific experience as an outlet to express myself and a way to cope with what appeared to be lightening striking twice. 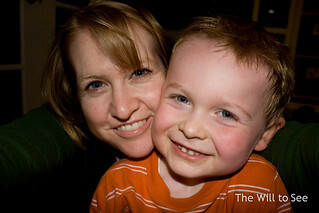 In one week we were elated to learn that Will didn’t have gastroenteritis, through an endoscopy and upper GI. However elation turned to devastation after discovering he had a rare eye condition called ocular albinism. This condition leads to a decreased amount of pigment in the retina and to diminished visual acuity and vision impairment. My blog immediately shifted from feeding difficulties to understanding his eyes. In March we found out that Jack may actually have a mild form of the condition as well and are waiting for confirmation at our next appointment in the fall. This isn’t what I expected motherhood would to be, but I feel lucky that my boys are otherwise healthy. We have tried very hard to make life as normal for both of them as we can through all of their struggles. The blog is a chronicle of the good and the difficult, since life with two boys can be a challenge even on the best days. I hope you will follow our journey and consider us for Project Mom.